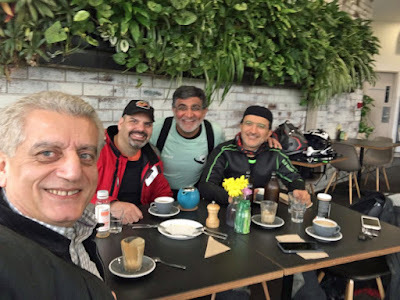 Our Shared Planet Motorcycle Adventures مـغـامــرات كـوكـبنا المـشترك للـدراجـات الآلية: Where? Sale? 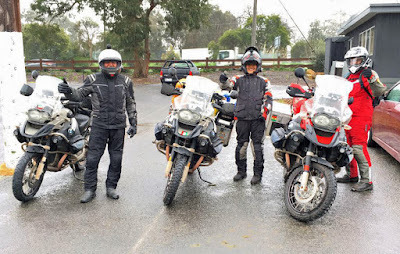 Once we reached Melbourne we got off the ferry and headed to Ringwood since we wanted to replace tires at BM Motorcycle and see Chris and his crew again. but they open at 9 and we got off the boat at 6:45 so we found a restaurant online that served breakfast and was 2 km away from BM Motorcycles, called Mister Fox. A nice place overlooking the golf course with great food. We were also contacted yesterday by a colleague of ours Mr. Mahmoud Chamma who was visiting for the week Eid Holiday, and he managed to came by the restaurant and say hello. The food was amazing and the atmosphere relaxing , I bet it is packed during the weekends. 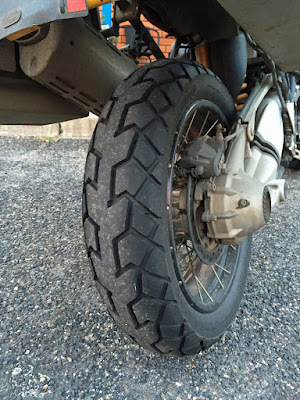 We headed to BM Motorcycles and Chris stated that Michelin didn't have the Anakee tires we wanted, and recommended Continental TKC 70's instead . So we went ahead with his proposal and the bike were ready about an hour later. Our initial plan was to get to Bairnsdale to start the Great Alpine Road. However it was cold and it was raining so we headed to Sale as an alternative. Reaching Sale we were very cold , we all got into our rooms and started the heaters with much of our thermalware still on us. upon inspection of the Great Alpine Road I found that it was very cold with a cold front coming in the next two days temperatures were going to be 4 deg. at max and -1 at min. No thank you we will take the coastal road. We are just not prepared to tackle such a route without electric heated vests. So our next stop will be Eden.